So on Boxing Day I made a bit of an epic discovery. It involved leftover curry. 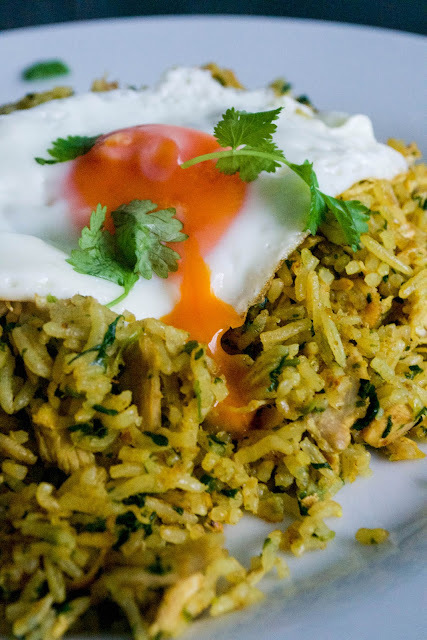 And I didn't know quite what to call it, so settled for Kinda Chicken Kedgeree. Because it's kind of like a kedgeree but different. We had curry for Christmas Day dinner and it was beautiful - I used this curry recipe here, used skinless, boneless chicken thighs and served it with Basmati rice and lots of coriander leaves on top. There was naan too, for the bread eaters. And I made loads of curry. So there were leftovers. In the morning, I came downstairs, opened my eyes and blinked into the fridge. There was a single serving of leftover rice and chicken curry. I took it out of the fridge, stir-fried it in a tiny bit of mild, flavourless coconut oil until a bit crispy (there wasn't much sauce) and added a block of chopped, frozen spinach. Once it was sizzling and heated through, I topped it with a fried egg and ate it. The rice turned crisp and slightly golden in places, and it had that toasty flavour that you get when rice is stir-fried. It had a bit of spice to it, too - and the chicken thigh meat was still tender once it was heated through. The spinach added colour as well as vitamins and the runny yolk of the fried egg just trickled into all that spiced rice. It was SO GOOD. 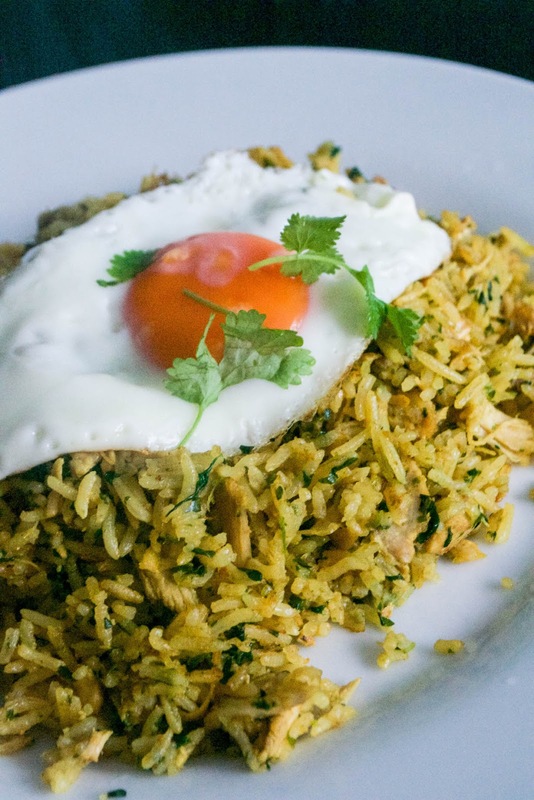 So the next time you had a single portion of leftover curry and rice, consider making this. Are you interested in paleo and AIP compliant curries? Check out my ebook SPICE, available to download in the Kindle store now.